As Internet of Things and Industry 4.0 trigger a sequence of industrial upgrades, the demand for machine integration and data interchange is also on the rise. Responding to the trend, Weintek is releasing an all-round cMT HMI solution which offers diverse high-performance HMI products to integrate miscellaneous systems. cMT Series models not only bring unprecedented visual experience with attractive, easy-to-edit project screens and built-in window transition effects, but also support powerful connectivity, including MQTT and OPC UA, direct connection with database, and more than 300 communication protocols. 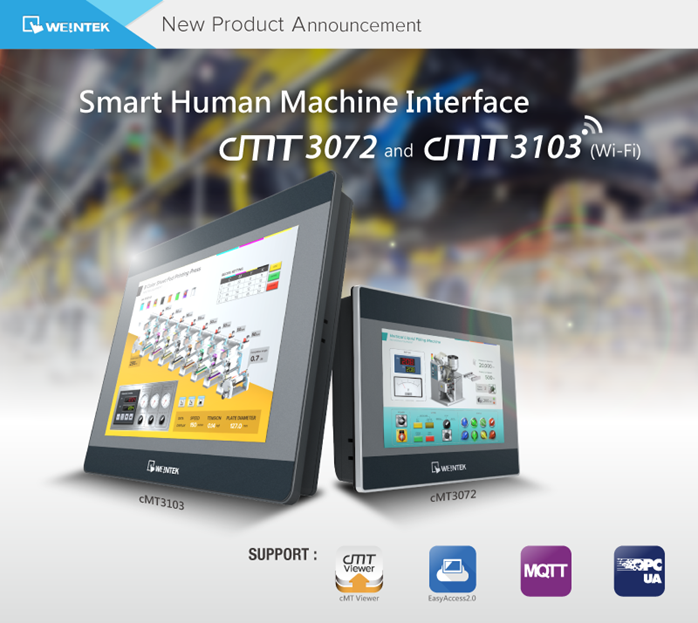 With the release of cMT3072 (7”) and Wi-Fi HMI cMT3103 (10”), cMT Series now comes in an even wider range of sizes. cMT Series also realizes multi-display and remote control. By running cMT Viewer application on cMT-iV5, smartphones, tablets, or PC, the operators are able to remotely monitor and control cMT HMIs, and at the same time use smartphone as barcode scanner, media player, or IP camera viewer. High Performance : Dual-Core Cortex-A9 1GHz CPU, built-in 4GB Flash and 1GB RAM. IPS LCD : High quality color reproduction and high resolution (1024 x 600 pixels) IPS LCD with wide viewing angle (T:85°/ B:85°/ L:85°/ R:85°) and minimized chromatic aberration makes HMI displays vividly regardless of its installation location. Wide input voltage range : 10.5 to 28VDC, compatible with most controller systems. Powerful Connectivity : Supports more than 300 major brands of PLCs and controllers. IIoT Protocol Support : Built-in MQTT and OPC UA server & client, and support direct connection with Amazon Aws IoT, which eliminates the need for hosting an MQTT server and allows connecting with low-cost and reliable AWS IoT MQTT server. Rich I/O : Dual-Ethernet, USB Host 2.0 . Con.A-COM2: RS-485 2W/4W/COM3: RS-485/CAN Bus, Con.B-COM1/COM3:RS-232. High Reliability : The water penetration resistance avoids corrosion of the PCB, and the two industrial level protections: PCB coating and power isolation ensure cMT3072’s durability and reliability in any harsh environment. Remote access service, EasyAccess 2.0 : The EasyAccess 2.0 license is included; therefore, activation using an activation card is not necessary. Wi-Fi Interface : cMT3103 supports Wi-Fi that keeps it wirelessly connected with other devices regardless of its installation location. Advanced Visualization : High resolution (1024 x 600 pixels) LCD with wide viewing angle makes monitoring less limited (T:60°/ B:60°/ L:70°/ R:70°).